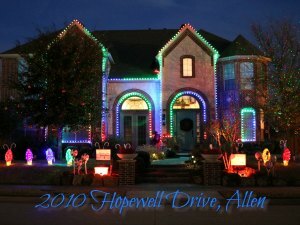 Are you interested in seeing your home and Christmas light display included here? Please visit our Submit My House page to learn the criteria we use when selecting homes to be included. We are accepting submissions all season to be included this year, but please be patient as we are a small team trying to keep up with submissions. 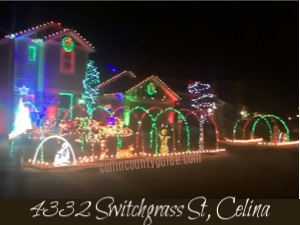 For a Google map of the Christmas lights in Collin County, click here. When sharing this link, please share this web page as this will provide the descriptions to go along with the map. 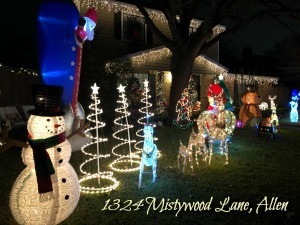 Typically neighborhoods are lit up by December 1, but keep in mind that weather may delay their installation. 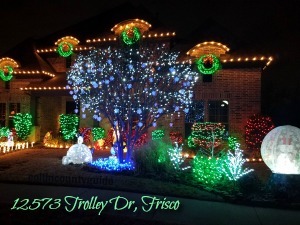 Check our dates here as some homeowners do not put up their lights until mid-December. Please be courteous when driving through the neighborhoods: respect personal property, keep your litter inside your vehicle, and keep your noise level down. Not everyone in the neighborhood participates, and these few courtesies may encourage future displays. Please do not stop your car on the same side of the street of the display as this blocks the view of other cars. Be aware of people taking photos or you'll be in their picture! Please be aware of traffic around you! 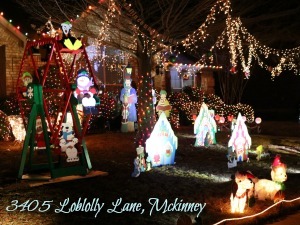 These are the neighborhoods in Collin County who's residents put on a coordinated effort of decorating. 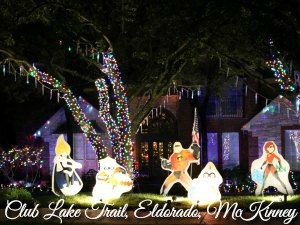 Eldorado holds their lighting contest in mid-December. 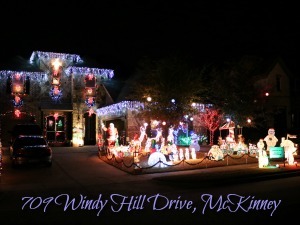 This has historically been one of the few neighborhoods in McKinney that decorate for the holiday. On our visit mid December in 2016, we found many of the homes in Eldorado put up Christmas lights, with some streets doing an amazing job coordinating their efforts. 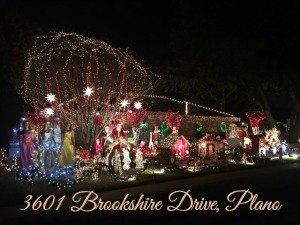 Our favorites included Club Lake Trail (cartoon characters), upper Augusta (nativity scenes and angels), upper Colonial Circle (Santa), Wind Ridge (Songs of Christmas), Brookside Lane (lighting lining the street). Check here for 2014's themes by street, because many people still use the same decorations. For that quintessential small town feeling of years past, drive through the neighborhood of Tucker Hill, located off Hwy 380, between N. Custer Rd and Lake Forest Dr. This is a great place for a romantic or family walk away from chaos. 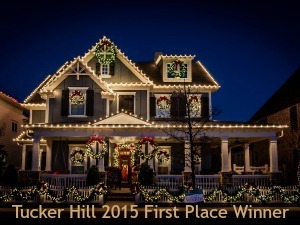 In mid December the neighborhood judges select the winner of the Tucker Hill light contest, which explains why when we visited on December 16 over sixty percent of the neighborhood was lit up! There are no public events, but Looky Lous are welcome. Use Greystone Court for your GPS as there are two homes here decorated to the hilt. 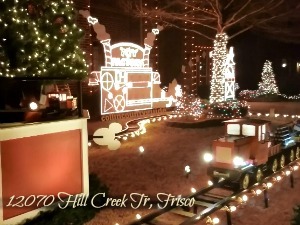 From there, drive the circle of Pecan Hollow Trail where there are several homes lit with displays. 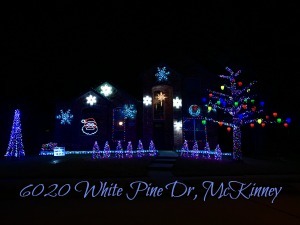 This is a great stop if you need to find several displays within the same subdivision. Huge reindeer around the clubhouse and a 14' Christmas tree. 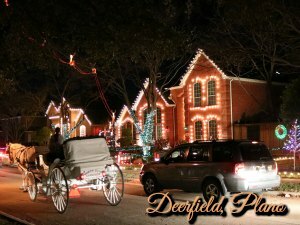 The Christmas decorating tradition at Deerfield began when the builders gave substantial prizes to homeowners for decorating for the holidays. 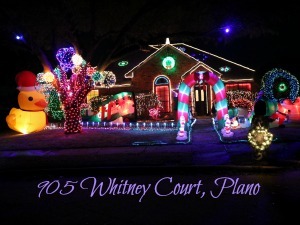 The tradition stuck, and this is now the hands-down, uncontested best neighborhood Christmas lights display in Collin County. Limo and Segway Tours are available as are carriage rides. Reservations are highly recommended. Families are encouraged to vote and text in their favorites. 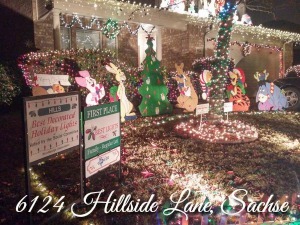 While you're in the neighborhood, be sure to see the Zephrie's home which was decorated by At Home again this year. Hey, Everyone! 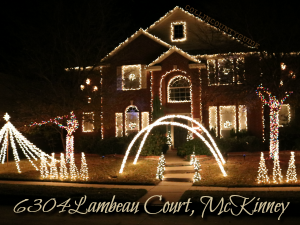 Residents keep sending us their fabulous light displays! 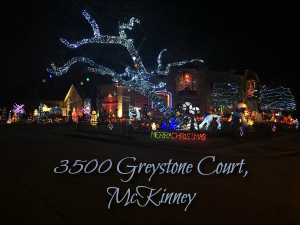 So keep adding to our list of the best Christmas light displays in Allen, Celina, Frisco, McKinney, Murphy, Plano, Prosper, Sachse, and Wylie! Free. This decor spreads across the entire yard. You'll find Santa sitting on his chair waving to the children and a trainload of toys. Check out the roof! This professional light designer has lit a 14-foot mega tree in his front yard for all to enjoy. Pick your favorite from the eight sequences with 800 pixels of light. Tune to 88.7 FM for the full effect! 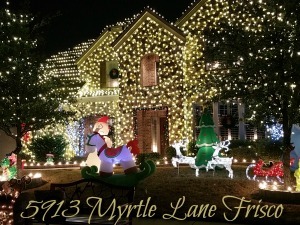 This homeowner puts out a display children will love with 45 characters and animations and an additional 3,000+ lights. 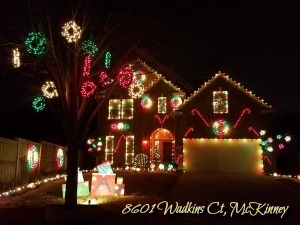 For the past ten years, Marilyn DeCoursin has been spreading smiles on the faces of children and adults alike with her displays. You'll find over 80 characters and decorations in the yard! Free, but please consider a donation to Send-Hope. This static display includes 20,000 lights, Minnie & Mickey and several Christmas inflatables. It takes the homeowner about two weeks working every evening to complete. 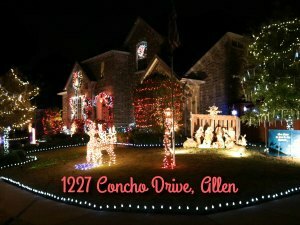 The homeowners here LOVE Christmas and Texas! 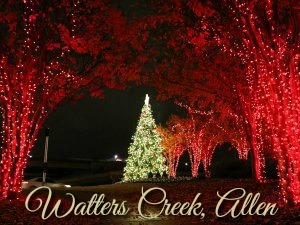 A lighted series of arches create a stunning centerpiece for their Christmas tribute to Texas with about 5,500 lights. Tastefully designed with a theme of Christmas trees and gift boxes, this is worth the stop when visiting Waterford Way. First Place Glendover Park for two years running with lots of lights, a Christmas Campfire, and lots more. See if the kids can find all six reindeer exploring the magical woods. 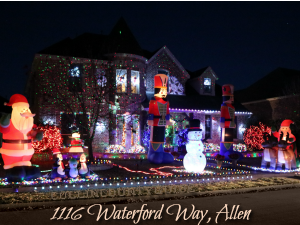 This home stands out in the neighborhood with the light show and music! Runs 5:30-11:00pm nightly, Thanksgiving night until December 31. 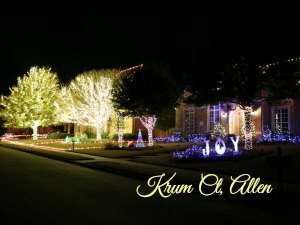 We were contacted by a neighbor on Krum Court who shared this display with us. She shared that this has been an annual tradition for years. Notice the intricate work of the lights on the two majestic trees in front of this home; absolutely spectacular! 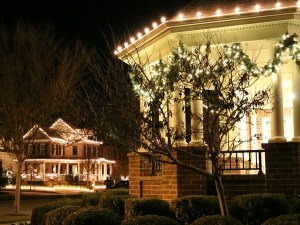 The homeowner advises there are 17,000 mini lights combined between the two trees. Runs 24/7 from about the first week in December until January 9, Dark (6pm) to Dawn. Inclement weather will affect the display. You'll know this home by the 24' nutcrackers flanking the front door. 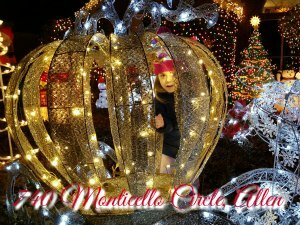 Five thousand lights in addition to laser lights, inflatables and Christmas music make this a fun stop for the kids. 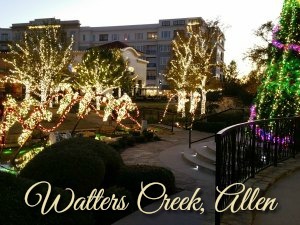 Lexington in Twin Creeks (just off Exchange at Ridgeview) has large lots, which provide the homeowners with lots of room to share their creative side with Christmas lights and decorations. This home just keeps getting better every year! 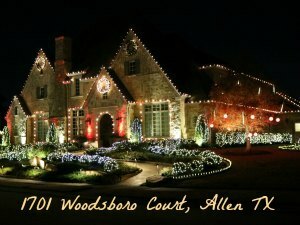 Woodsboro Court has two of the best decorated homes in the neighborhood. Be sure to drive to the end of the cul de sac where you'll find 1710 Woodsboro Court tucked into the corner, not quite visible from the entrance to the cul de sac. This home likes to change the color and theme annually. Free, but please consider donating to the charity collection at the show. Over 25,000 lights with 20 ft Mega Tree and Singing Santa! Tune your radio to FM 89.1 to hear the music on your car radio. The mega tree lights are tuned to FM 92.9. "The House on Switchgrass" invites you to step out and take a photo in front of their selfie photo booth. 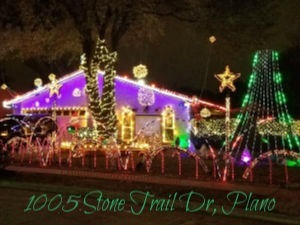 One of the original and largest residential computerized Christmas light displays in North Texas, Jeff Trykoski has been bringing Christmas joy to fellow residents since 1998. View Displayon youtube. 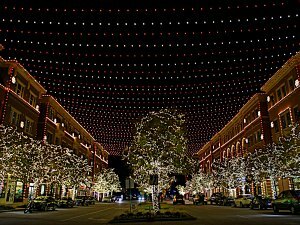 While in Frisco, visit Jeff's other project, Frisco Square. 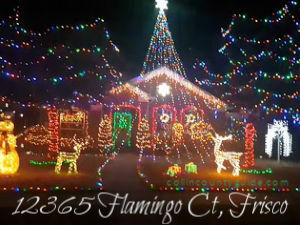 This light show may be heard by tuning to 88.3FM or on the outdoor speakers. Here you'll find a 6' nutcracker and thousands of lights. December, 6pm-midnight. Heavy rains may affect display. This display is an 'old twist' requested by visitors: the music plays and the lights stay on. This homeowner strings all the lights himself, as he has for over a decade. You'll notice these displays from Eldorado Parkway if you look north. Both are Christ-centered, static displays, and fill the front lawn. If you love toy trains, don't miss this house! There's a 10' homemade train that travels around the front yard, coordinated with the Animated Toy Factory. A 24' artificial tree also has a train that runs around the base. We caught this house on the advise of a neighbor and we are delighted to share it with you. This little street is nicely decorated, but this house stands out from the rest. The photo could not encompass the entire display. 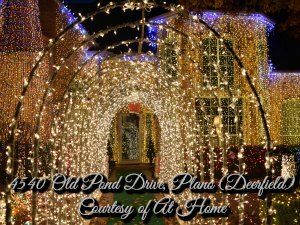 Family members own four homes in the area and they delight in entertaining families with their elaborate Christmas light displays each year. Children are encouraged to walk through the arches and around the lights. Several hundred village houses are on display, many of which have been donated by grateful visitors through the years. 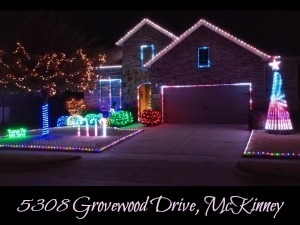 This homeowner installs all 10,000 incandescent lights for this static display on his own! While technically in Denton County, these are just a short drive west from the Collin County border and would be a popular spot for our West Collin County residents. 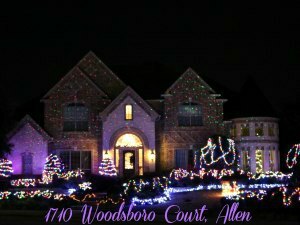 The Burkman's home and yard is covered with lights! Check their Facebook page for special events, including visits from Santa and his elves, which draw between 500-700 visitors! 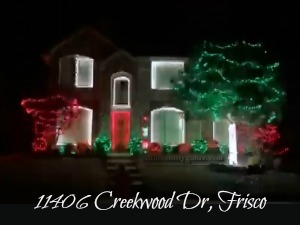 If you think Clark Griswold needed a few more lights on his house, then you'll want to drive to Frisco to see this display! 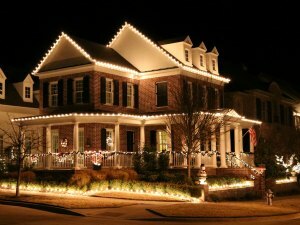 The entire front of the house is covered with lights, but it doesn't end there--yet it displays cohesively. This home makes a wonderful backdrop for the "I went to see Christmas lights tonight" selfie! Colors change annually. Free. December 1-January 1, 6-11pm. This is a sprawling lot with a circular drive and it is a delight to see! Catch Santa as he pauses to check his list on his way toward his sleigh full of gifts, the deer drinking from a blue river of lights, the snowmen among the light-wrapped trees...and more. December 1-January 1, 6-10pm daily, rain or shine. The kids are going to love this one! Life-size cases, built by the homeowners, of Santa and his elves and another of Santa and Mrs. Claus are just the beginning of this beautiful display--which started over 30 years ago. 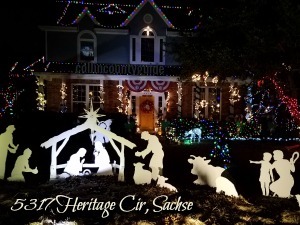 A nativity set, angels, and a tree-lined lit driveway add to the charm, and a light show was added in 2018. Each year the homeowner's family work together to add new features. BEWARE: This is on a busy, narrow road, so if you'd like to get out, the homeowner recommends you park on the north side of their property at the end and walk along the property to get a closer look. If the dogs are out, the homeowner assures us they are behind an invisible fence and cannot get out. While this home doesn't meet our 10,000 minimum light criteria (yet! 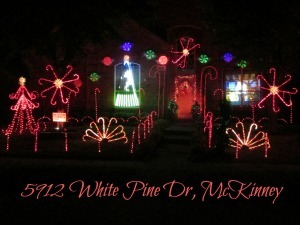 ), if you're visiting Tucker Hill head north on Lake Forest and check out this light show. You may see the display on youtube here or visit their website. This large corner lot is well-coordinated and stunning. There's even a digital Santa display, weather permitting! 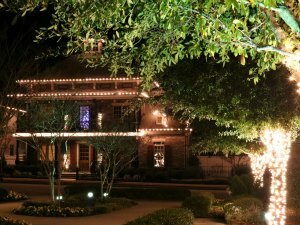 Be sure to check out the homes on Pecan Hollow and follow the circle around to see the other homes lit up for the holidays. Light show is synced with the neighbor across the street (6305). For the light show, there are 33,000 lights on 64 channels with projectors, floods, and other surprises. Tune to 107.7 FM. 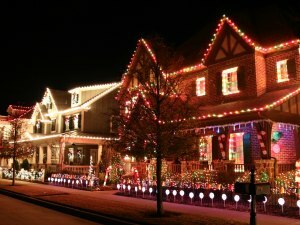 There are three Griswald-style decorated homes on this street. 6400 Lambeau Court goes all out with Disney characters and a photo booth for visitors to take their photo in Mickey's workshop. Runs November 27-January 2, 5:30-10pm nightly. Free. 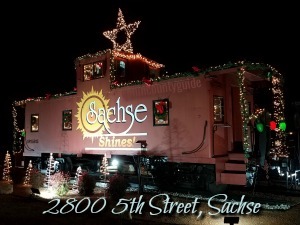 Runs typically Thanksgiving Day - January 1 night, 5-11pm. Over 10,000 lights and about 100 hundred characters and yard decorations, yet all done tastefully with a focus on the Reason for the season. Best Christmas Light for two years in their neighborhood. This "gingerbread house" is made up of 10,175 lights, wreaths, balls and yard art. This will be a long-time favorite of the kids and adults. Everything at this home is created and installed by the homeowner, which takes 26 hours to install! Runs November 27-January 1, 6-9pm nightly (unless there is bad weather). It's that time of year where the Hunt family displays their Christmas spirit. We are featuring dancing and twirling candy canes throughout our yard, peppermint candies chasing each other, and even a candy cane holiday tree. Be careful and please do not block the street! 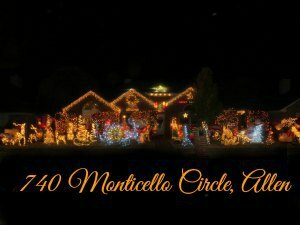 A 32-channel light show with over 12,000 lights, a Singing Santa, ten mini and a mega Christmas tree. 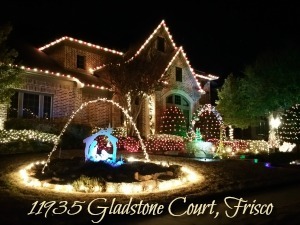 While you're in the area, stop and see this nice display of 15,000 lights. 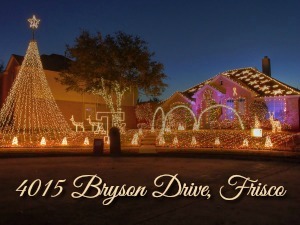 Over 10,000 lights and sixteen characters, sixteen channels broadcasting over 96.5 FM. Santa waves from his sleigh, toy soldiers flank the driveway, and a wooden carousel with animals create a delightful display. Runs November 26 thru New Years Eve, weekdays 5-10pm; weekends until 10:30pm. Link is to YouTube video. Over 24,000 lights, this light and music show takes more than 200 hours to create. Each year the display grows. 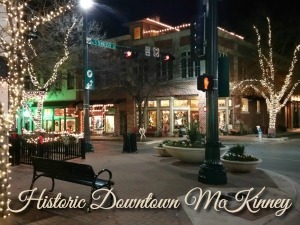 Located in the historic district of McKinney. East of Dallas North Tollway and West of 75. Free, runs Thanksgiving weekend - January 15, 6-10:30pm weekdays, 6-11pm Friday-Saturday. 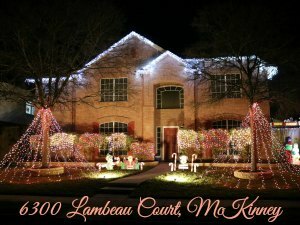 This homeowner spends about 90 hours installing 30,000 lights and 20 flood lights. Children are invited to mail their letters to Santa or take a photo as a Snowman. The homeowner's 13 grandchildren (number of stockings on the chimney) are the inspiration for the display, which began in 1998. Princesses, Santa, Santa's Toy shop, Star Wars, Penguin Village, Snow White and the Seven Dwarfs, Elsa and Olaf and The Wizard of Oz all in one display. A treat for children young and old. South end of Plano. Free. December- January 1, 5:30-10pm daily. Inclement weather affects this display. Free. Candy canes and snowflakes are the theme at this house. Nov 24-Dec 31, Dusk - 1am nightly. There are two themes at this home: ducks and dogs for the homeowner's daughter, and aircraft and vehicles for the homeowner's obsession. The duck is almost the size of the house! LED lights and inflatables create a colorful, kid-appealing display. Trivia: The homeowner used a 3D printer to print custom clips for the roof rope lights, because the commercially available ones break after a year and don't work on shingles! He uses high wind text alerts and an internet-connected timer on the inflatables to shut them down remotely during high winds. Click for a drone view of the lights! Free, but please support the families of fallen officers by donating to C.O.P.S. at the show. Thanksgiving through January 1 night, lit nightly from dusk-11pm. These Sachse homes, while clustered within a couple of miles of one another, fall in and out of the Collin County line. 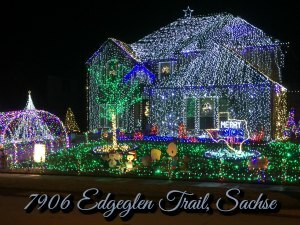 Since Edgeglen Trail is within Collin County, and we know you want to see all of the great light displays in the area, we've included those in Dallas County as well. All of these displays are free to view. 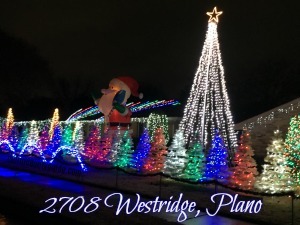 2015's winner for Best Decorated from their HOA. 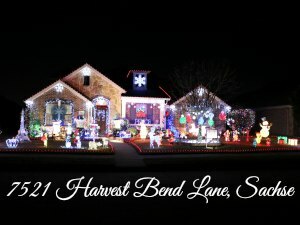 Harvest Bend Lane also took Third Place for Best Street in the City of Sachse's lighting contest. 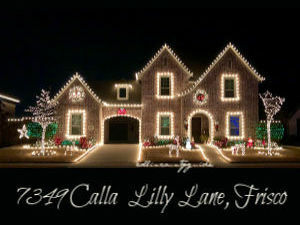 2017's Third Place winner for Large Lot in the City of Sachse's lighting contest. Heritage Circle also took Second Place winner for Best Street. 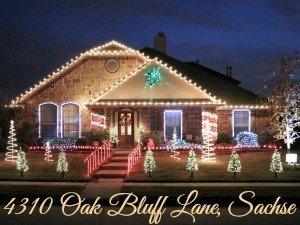 2017's Second Place winner for a Small Lot in the City of Sachse lighting contest. There are only 3,000 lights, but the creativity here is in the Polar Express train with steam blowing out of it on the front lawn. Don't miss the oversized tickets, handmade sleigh with a pair of reindeer, and snow (Friday and Saturday evenings only). 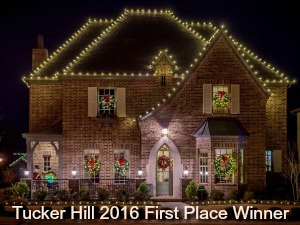 2017's Third Place and 2015's First Place winner for a regular lot size in the City of Sachse lighting contest. Runs nightly November 25 thru December 31, 5pm to midnight. 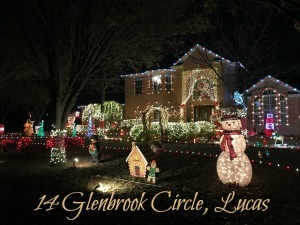 Best Decorated house for 2014, 2016 and 2017 in their HOA. This Disney-themed display includes six-thousand lights, snowfall spotlights, a Santa projection, and fourteen characters including Mickey, Minnie, Elsa, Anna, Sven, Olaf, the Grinch, Santa, and Minon. Drop off a letter for Santa in his mailbox! Free, but please consider donating to the Cure Sanfilippo Foundation to help Declan, a 4-year old boy in our neighborhood. 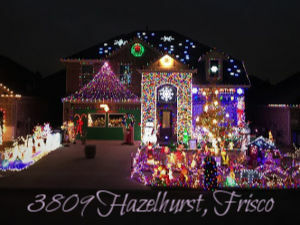 2017's First Place for a small lot winner of the City of Sachse's lighting contest--and you'll love the creativity shown at this home. 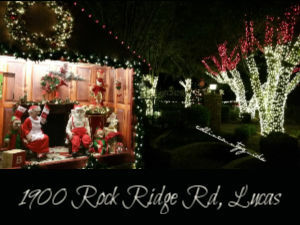 Lighted arches over the sidewalk provide a magical experience for the young and old alike with Christmas music playing as you walk thru. 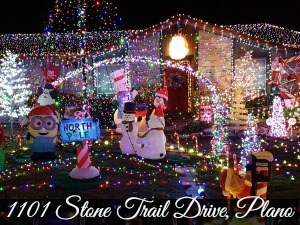 Other creative touches include Santa's laundry 'drying' on the clothes line, Santa waving from the window, a projection of carolers singing, a 12 foot Santa welcoming passerby's, Santa telling a story and singing, the Grinch sleigh parked next to the driveway, and beautiful Angels. Lights and multiple projectors make this a fun destination. 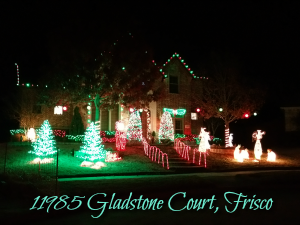 2017's Second Place winner for a large lot in the City of Sachse's lighting contest. You may remember these wonderful decorations in years past from N. Bluffview Drive in Lucas. 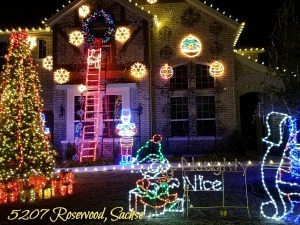 The homeowner has now relocated their characters and lights to Sachse. 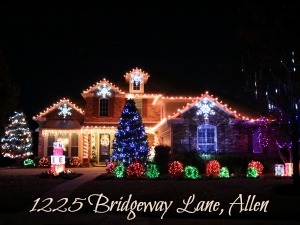 First Place winner of Best Street in the City of Sachse lighting contest. The 35-foot tree featuring over 20,000 lights isn't the only thing lighting up the courtyard in front of City Hall. Trees have been strung. A great place for a quiet stroll. 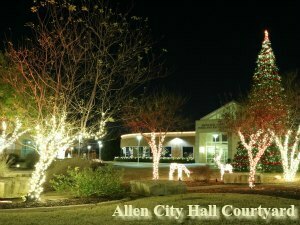 The City of Allen has placed a second 46-foot Christmas tree with more than 20,000 lights at the roundabout in front of the library. Stop by The Grove at The Village at Allen and enjoy our Holiday Tree -- complete with 100,000 interactive sparkling, dancing LED lights and Holiday music. Note: In 2018 only the tree is on display. Stop by the Macy's Fountain entrance at Fairview Town Center and enjoy our Holiday Tree - complete with 100,000 interactive sparkling, dancing LED lights and Holiday Music. The town has installed a lovely Christmas display in front of the Town Hall. Be dazzled as the 30-foot tree leads a 145,000 glittering light display that includes 20 other trees and Santa's sleigh with reindeer. 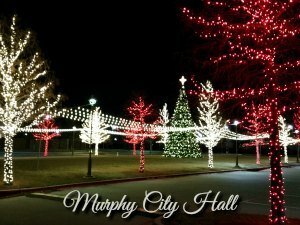 The lights are synchronized to holiday music and play every hour from 6-9 p.m., Monday-Saturday through New Year's Day. Free carriage rides; check website for times! 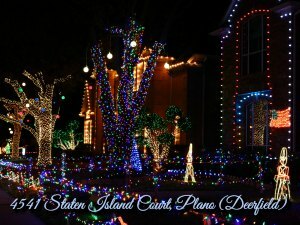 Over 175,000 lights, 11.5 miles of wiring and 8 miles of extension cords to create this a one-of-a-kind computerized light show nightly. 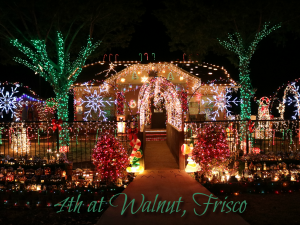 Visitors may drive through the streets and listen on their car radios, or stroll along the sidewalks of Frisco Square to enjoy the dazzling display. Follow the link to the website for many activities held throughout December including skating and carriage rides. Rows of trees abundantly lit in white create a festive holiday experience. Stroll through this beautifully restored historic town while you "shop local" at the various boutique and specialty shops, enjoy dinner or a special treat. 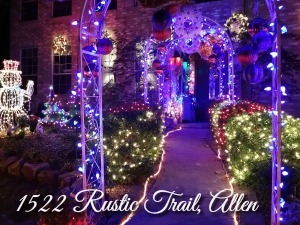 Guests will see lights and holiday decor along a half mile Heard nature trail. Photos with Father Christmas and Mother Nature, live holiday music in the outdoor amphitheater, family-friendly entertainment, and hot cocoa and treats available for purchase. Do you prefer quiet places where you can walk under the Christmas lights? 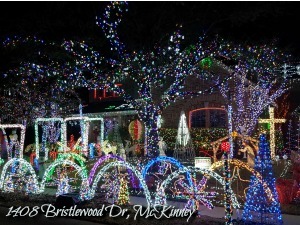 This display is so pretty that it caught our eye as we were traveling down Murphy Road. The red and white trees at the entrance draw you into the back courtyard where you can enjoy a "forest" of well-defined red and white lighted trees. Free. A walk-in lighted gift box, ideal for selfies, adds to the music pumped through speakers, lighted trees, and the spectacular fountains. 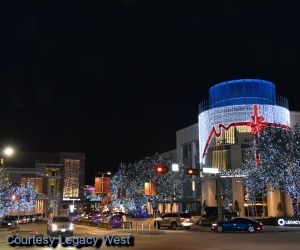 Walk under the beautiful 1.1 million twinkling lights as you stroll this outdoor shopping center. The Christmas tree, which is 65 feet tall and has 100,000 lights, is located in front of the Marriott. The tree has three times the amount of lights as the Rockefeller tree and equates to six miles of strands! 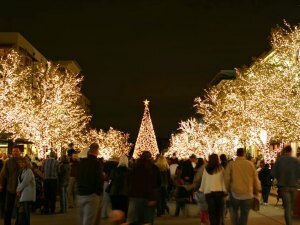 The only Christmas tree with synchronized video and music in the state of Texas. On select nights there will be additional holiday entertainment, such as carolers and live reindeer. Located in The District. December 1-31, 5:30pm to 10:30pm Sunday-Thursday; 5:30pm to 10:50pm Friday and Saturday. 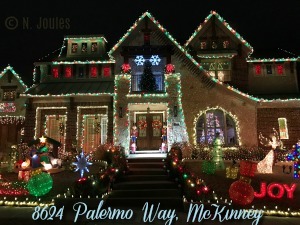 The Colony Christmas Spectacular light show is choreographed to music. And spectacular it is with 300,000 lights, six 13-foot pole trees, (5) 8-foot wire frame trees, (20) mini-trees, one giant pixel tree, 260 strands in the lawn fan, (5) 20-foot "leaping" arches, (13) 10-foot vertical poles, a six-foot star, (20) wall-washers, and 24 snowflakes of various sizes! Tune your radio to 99.9FM to enjoy the music. 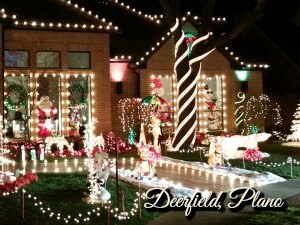 Our friends at Denton Family e-Guide have created an excellent list of displays in neighboring communities. Be sure to check them out! Please submit your additions for consideration to info@collincountyguide.com.